I believe that using broodies of whatever species is the most surefire way for a beginner (or veteran, for that matter) to get ducklings or goslings hatched. An incubator, however, has certain advantages. No need to worry about whether broodies are available. One can remove the eggs to allow a good female to produce many more eggs. A well managed incubator can often come close to the percentage of hatch achieved by broodies. 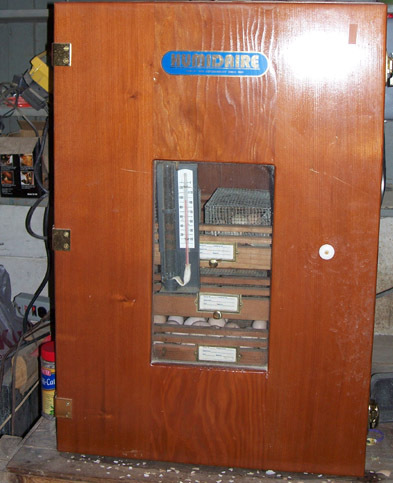 This is one of the two Humidaire cabinet incubators used to hatch both chicks and ducklings at Acorn Hollow. Entire books have been written on the subject of artificial incubation so only the essential points can be touched on here. First and foremost, what type of incubator should be used? Today, much of the guesswork has been removed as virtually the only type of incubator sold today is the type one should use, namely the forced air style of machine. That means a fan runs constantly to move the air. The fan insures that all eggs will be close to the same temperature and that gasses produced will not linger in any corner of the machine. Beyond that, there is a huge variety of forced air machines on the market from relatively inexpensive Styrofoam units to cabinet machines costing thousands of dollars. The fact is, all of these types can bring off successful hatches but each has its own set of qualities and disadvantages. Before attempting to operate any incubator for the first time, I suggest that you do two things: read the instructions first. Then, if at all possible, speak with someone who has had experience and success operating that type of machine. One can pick up invaluable tips that way available from no other source. If the machine to be used is not new, make sure that it operates properly. Never set eggs in any incubator without having run it for several days. Does it hold temperature properly and consistently? If not, look not only at the thermostat but at the location of the machine. If one has placed it somewhere where the temperature varies much, that could be a problem. Also be sure that the machine is located where it is not subject to external vibrations and that it is level. Remember that the amount of humidity in the incubator is critical. Some Styrofoam machines are so tight that they will drown eggs unless all vents are open and unless the eggs are cooled daily to permit some moisture to escape. One can never replace moisture that has escaped from an egg; one can only slow down moisture loss. The most reliable way for one to gauge the amount of moisture, is to watch the size of the air cell as the incubation process progresses. By the time an egg is ready to hatch, about 30 percent of the egg should be air cell. Less than that and the duckling or gosling will be too bloated to maneuver in the egg to complete the hatching process. If there is too much moisture loss, the little bird will be too small and weak to hatch properly. In my experience, the eggs of waterfowl hatch best when they are laid on their sides and turned 180 degrees twice or three times each day. I do not use automatic turners that do not allow for that. One of the biggest and most common mistakes made by novices is failure to keep the incubator door shut during a hatch. Every time you open the door to “take a peek”, you let humidity escape and by so doing, upset the ideal hatching situation in the machine. Better to miss one or two turnings of the other eggs in the machine than to be opening the incubator during a hatch. Ducklings and goslings should be allowed to remain in the machine until they are entirely dried off. Last but not least, remember that the incubator is the ideal place for bacteria to thrive. Hatching residue should be removed and the hatching tray and bottom of the incubator should be disinfected after a hatch. During incubation, eggs should be candled weekly and dead embryos should be removed. One bad egg allowed to remain until it explodes can terribly contaminate an incubator and affect all subsequent hatches. Most important, learn from mistakes made and do not repeat them.